So the T-Dub train keeps rollin. 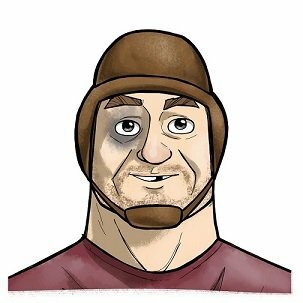 I hope the pain has worn off a bit, and we can dissect some of the things that the Sooners ran into on the field goal drive and we’ll hop into the infamous 3rd quarter come next week. 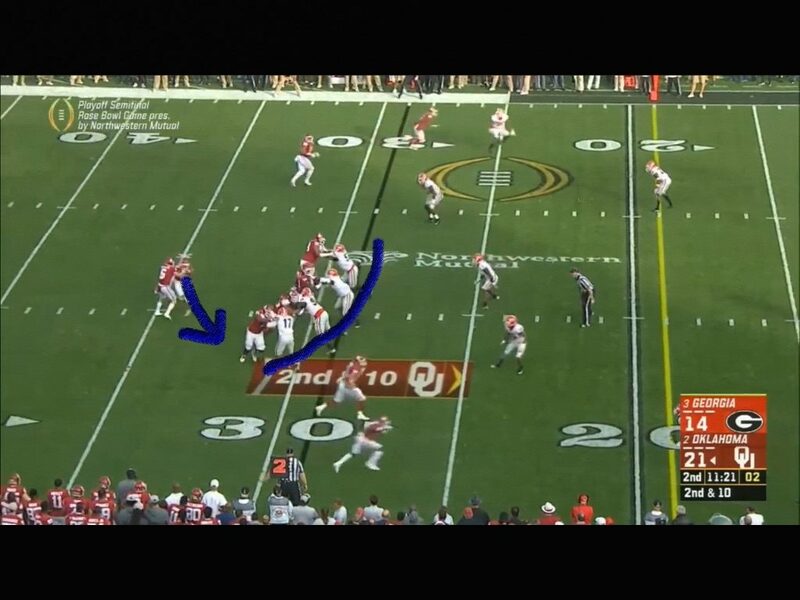 The Sooners were having success early and often with the straight ahead run game and then play action off of it. Admittedly I haven’t gotten into the 3rd quarter yet, but it felt like the Sooners got away from what was working early. They also just missed some plays, and honestly you can’t be perfect all the time. 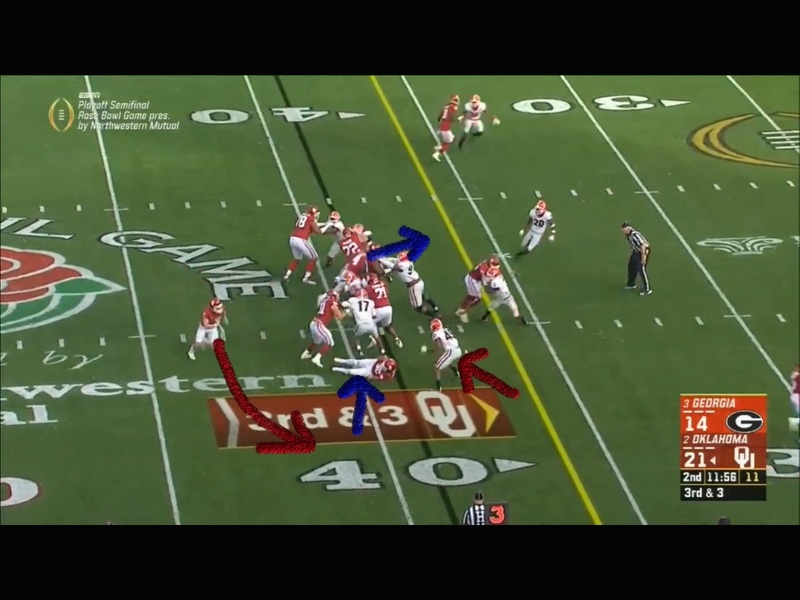 Here, Hollywood is faking the Jet Sweep freezing that backside player and it’s a read option. 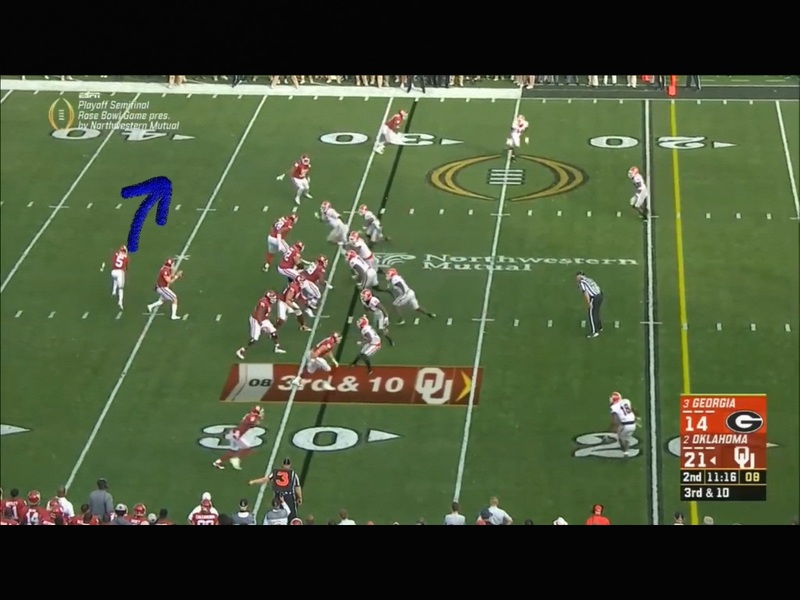 It looks like a called give, because there’s nobody home if Baker keeps it to the boundary. A tick later, it really opens up and Samia has worked up to the linebacker nicely. Anderson has a good lane to get up into behind Samia and Andrews along the blue arrow path. After a nice gain of five, it’s run again, which you all know I love, and it’s a straight ahead power look. 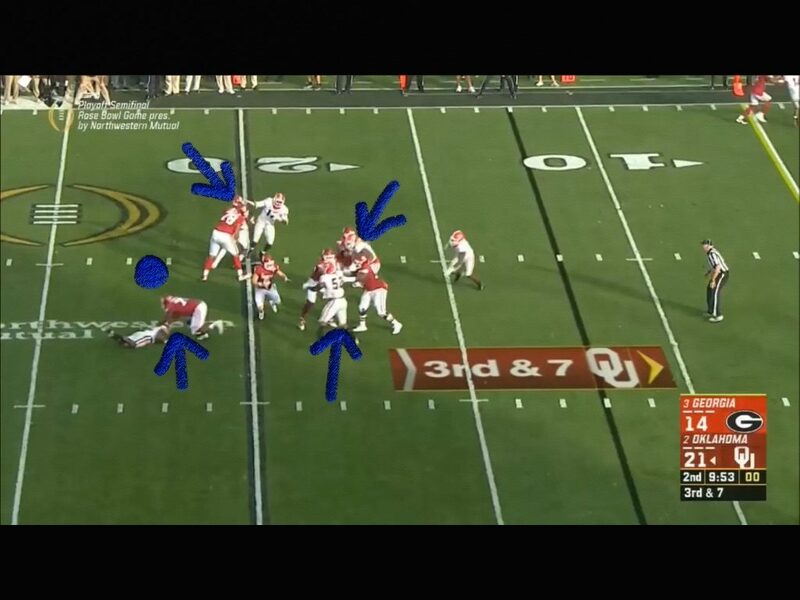 Big Orlando Brown is coming around to “swab the hole” where that linebacker should be as he rounds the bend. You can see as the linebacker contacts Orlando, it knocks the big man back on his heels. He still makes the block, but this is how you fill a hole. If you can’t make the play you have to knock the blocker back into the hole to clog it up. That physicality is what our defense was missing. Rodney doesn’t stay with the play, and tries to bounce outside. 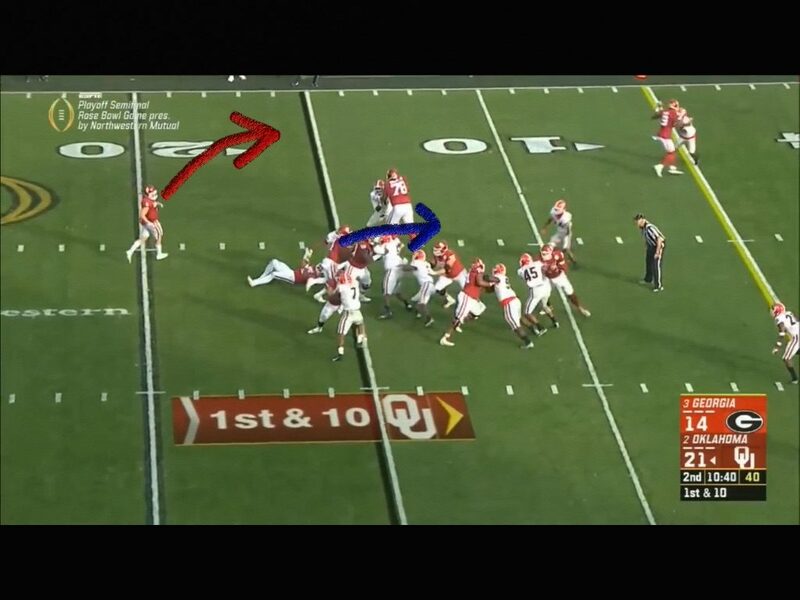 If he stays on the blue arrow path instead of going to the sideline, he may get a couple . 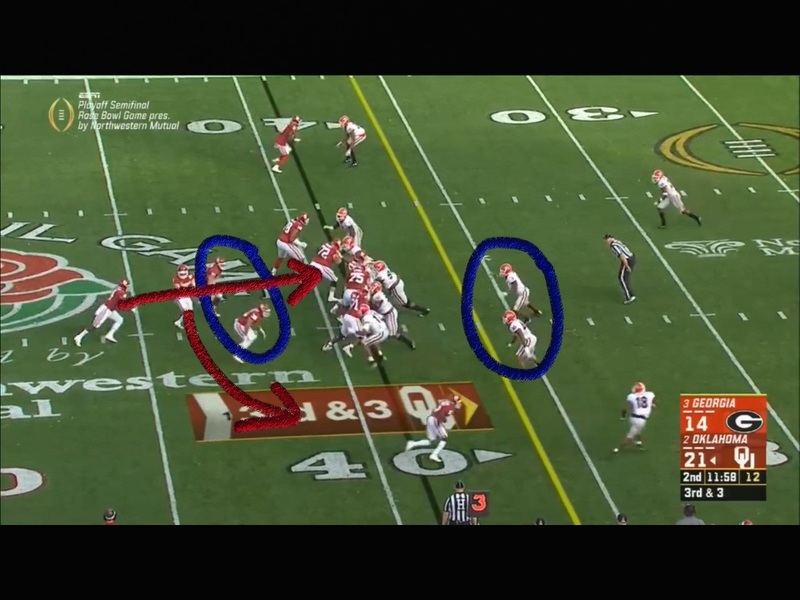 On the next play it’s the old diamond formation with Andrews, Flowers and Sermon in the backfield along with Baker. 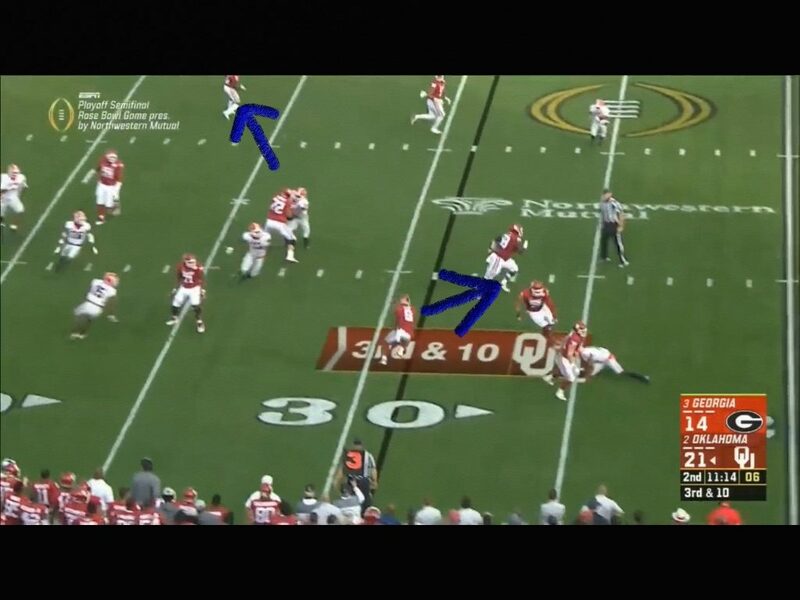 The two circled, Andrews and Flowers are the blockers for the two circled backers, and right here, if Oklahoma schemes to numbers better, they have georgia outnumbered on the dive/give to Sermon. The Safety, #20, comes up in the middle of the field, but had the ball been given to Sermon I’ll bet he would have scored right here. If you rewatch this play, and have watched Trey this year, he’s physical and slippery. I doubt that safety brings him down, and it may have been a big play. 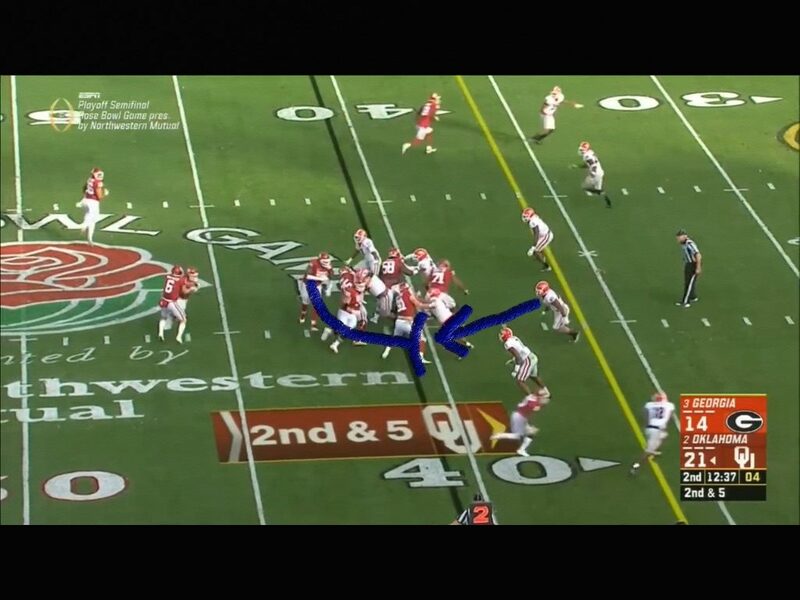 Still it looked like a designed keep, and Baker kept it for a nice gain and the 1st down. 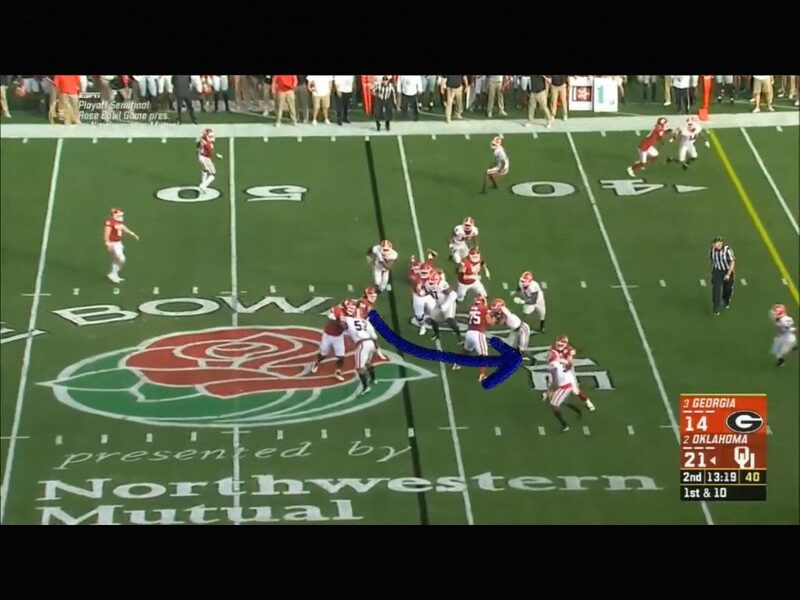 Flowers is lucky that he didn’t contact #17, because with Andrews up high, this could have been a chop block. 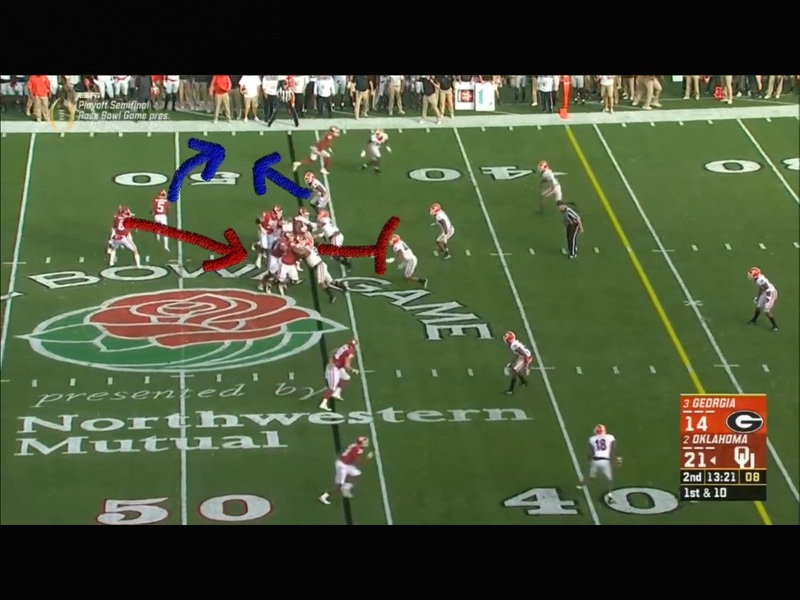 Sticking with the play action, Georgia had to play it honest to keep people back in coverage. 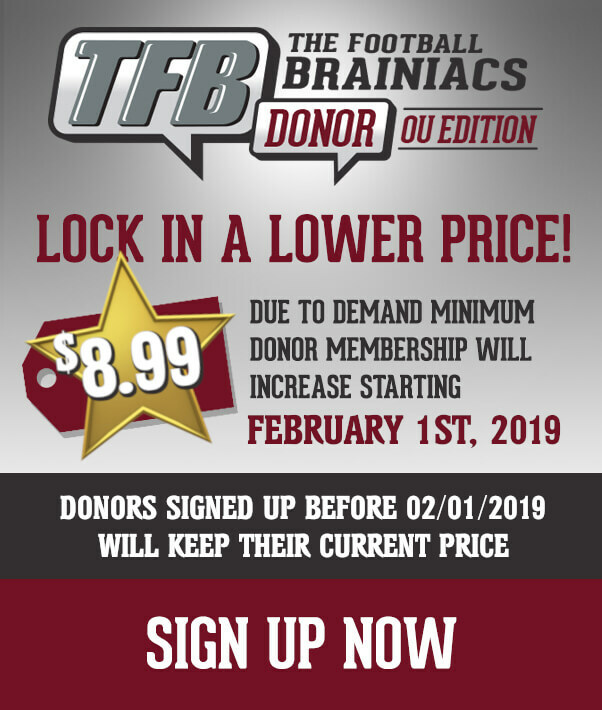 Also they couldn’t send extra rushers, because when they started having pass rush success a lot of it was when they were sending more people than Oklahoma had blockers. 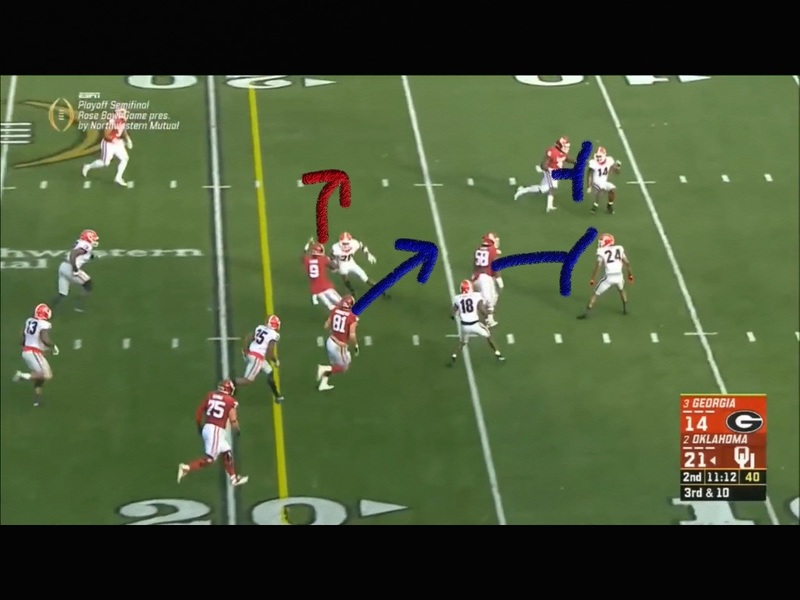 As you can see here, with the play action, the linebackers are frozen and the Georgia defense had to account for the run game since it was already having a monster day. And now look at the protection. 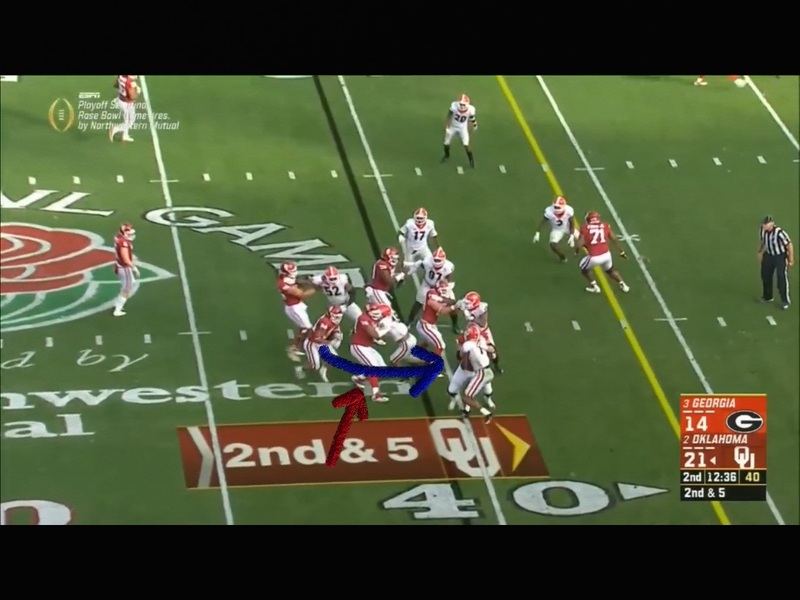 Since the fake to Sermon took the d line away, Baker has a clean pocket with no threat of a rush. The safe throw and likely a 1st down here is to Flowers in the flat. But Bake is seeing Lamb coming free since the Safety jumped outside too hard thinking that Baker was going to take the safe throw out to Flowers. And this was just one of those throws that Baker was just a smidge off on. He throws it a bit behind Lamb and it falls incomplete. We’ve seen him make the throw a hundred times, but this one he just missed. 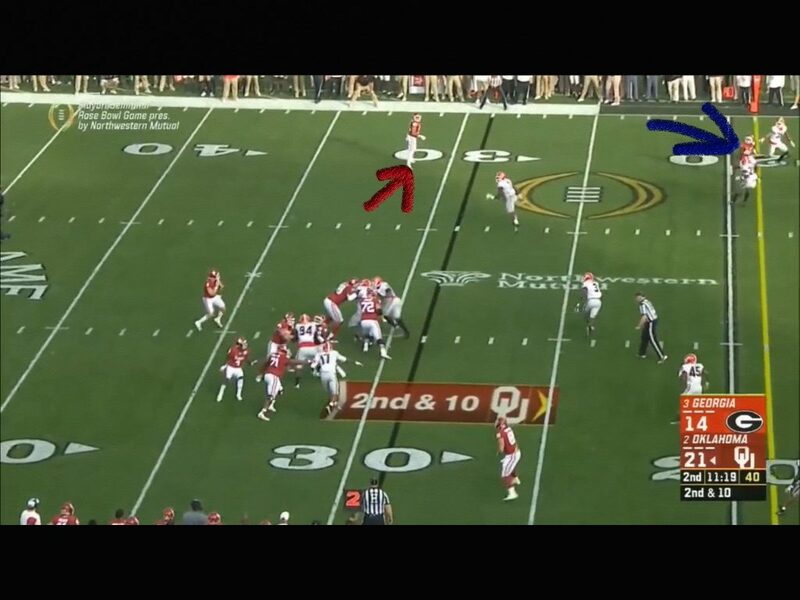 If it’s at the Blue X, Lamb likely catches it in stride and puts a move on the deep safety and goes in for the score. This one play, the squib, the 55 yard fg after the squib, the pick ran back, the 75 yard td run, etc, if just one of those plays is/are different it’s a win. Still it’s a game of inches. So here you can see on 3rd and long, and zero threat of play action since it’s a snap, long yardage and the belly back aption by Brown, that you have everyone up around the line of scrimmage and it’s going to force a quick throw. Even though the guy over Andrews down on the bottom drops at the last minute, you still have six guys coming and only five blockers. But it’s a perfect call at the right time by Riley and company. It’s a tunnel screen to Lamb at the bottom, and It’s set up very well. Wren is heading south, and Lamb’s getting up in there. Bake also had Hollywood at the top, but throwing over those defenders out there may have been a bit risky. 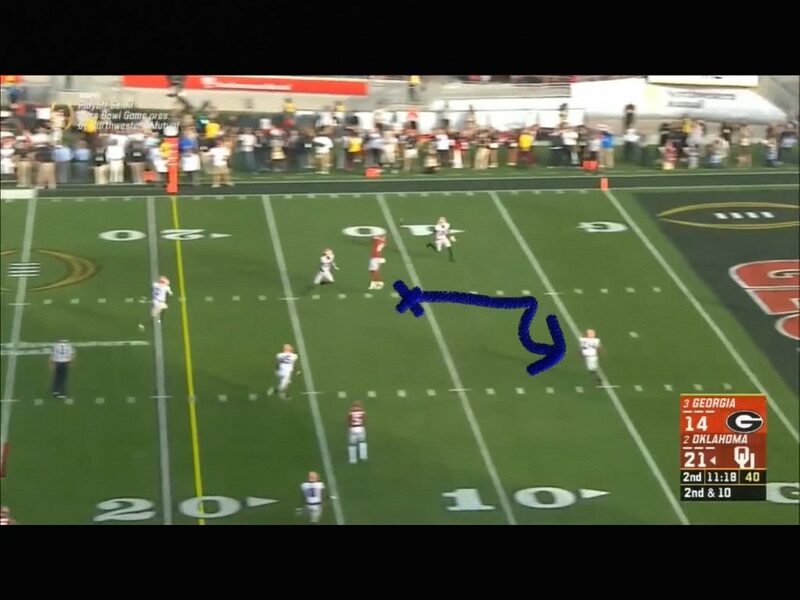 And this is where I think if Lamb stuck with the direction of the play he gets a few more yards, or maybe breaks it. 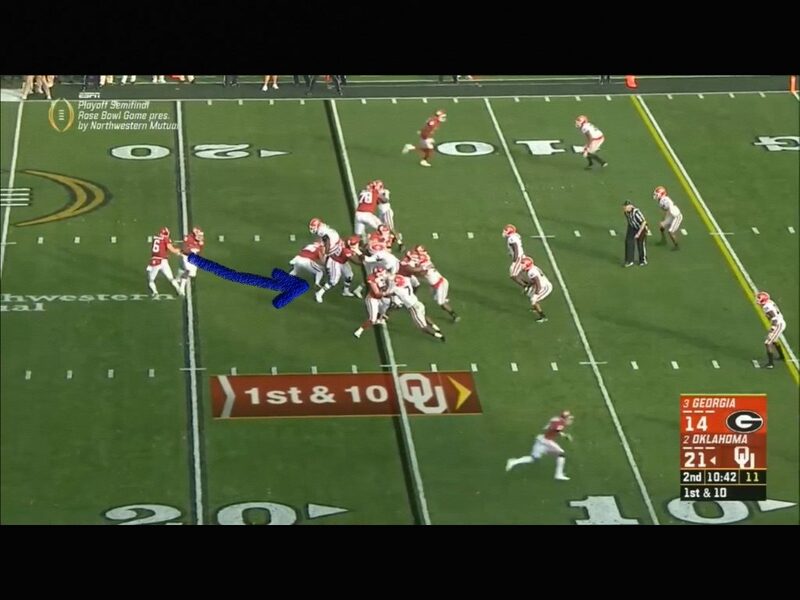 He tries to cut back here instead of hitting the gass and trying to outrun 18 and the guy he’s trying to juke. Then he got earholed by the pursuit player coming hard from his left. Still a heck of a job to hang onto it and get the 1st down. Of the 3rd and 7, Baker just tried to do too much. He has a magnificent pocket to settle in with a double to the top, going clockwise, the middle is blocked well, and Evans at bottom has smashed his guy. He completely negates Samia’s leverage by going right and directly into the arms of the d tackle when he didn’t need to. Nothing is more frustrating when the QB goes outside of your leverage when you have him protected.